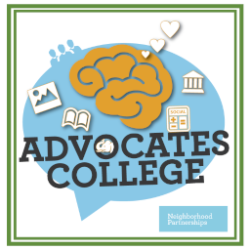 In the June 2016 newsletter: We're re-launching Advocates College, RE:Conference scholarships are available, bring an Asset Building Summit to your community and read links worth clicking. For more than six years, leaders from across Oregon have come together to learn how we can change the way we speak about the issues we care about to be more effective in our advocacy with decision makers. We call it Advocates College. Now you too can learn the research-backed techniques for communicating powerfully and effectively. At the end of the training, you'll be more confident speaking to legislators and crafting messages. You’ll get lots of help and practice developing and testing messages on the issues you’re working on. You'll join a cohort of Advocates College graduates who will work alongside you and provide feedback for years to come. And most importantly you'll have the tools you need to more effectively advocate for the policies and funding for the programs and issues that matter most to you and your community. You can attend an in-depth three-day training, which with the assigned reading and homework will help you build skills that you can apply to any issue. Or choose a condensed two-day training with an emphasis on housing or asset building advocacy. Limited scholarships are available. June 30 marks the end of our fiscal year at Neighborhood Partnerships, and what a great year it's been. We've grown our ability to bring opportunity to all of Oregon this year (though we've still got a long way to go!). We have a strong team and, as you'll see throughout this newsletter, BIG ideas for work that needs doing in the year to come, especially when the Legislature comes back to Salem in 2017. Can you be part of our success? Ask your friends, family, co-workers to sign up for our newsletters. And, please donate to make sure we have the resources we need to make the BIG ideas come to pass. Neighborhood Partnerships strives to increase opportunity for all Oregonians. 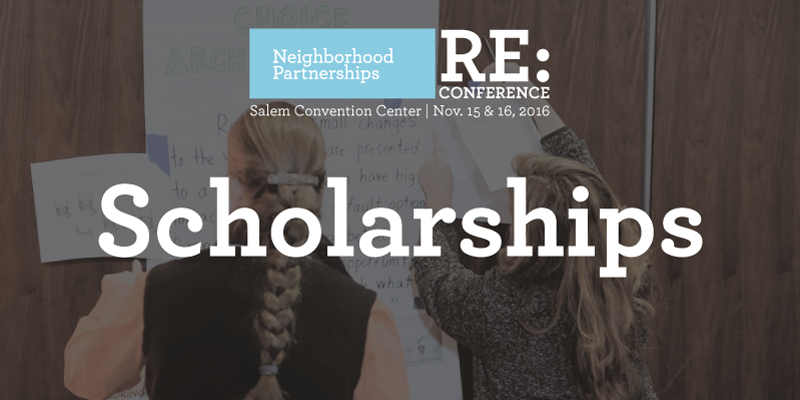 We offer scholarships to our RE:Conference to ensure that we have wide representation from communities that face barriers to participation. As you complete this scholarship application, please make sure to explain how this scholarship will benefit communities across Oregon. Please highlight the work you do with communities of color, in rural communities, with people with disabilities, with people experiencing homelessness, etc. We will hold 2 rounds of scholarship application review – the first will take place on September 1st, the second will take place October 31st. For People Who Want to Get Beyond Simple Poverty Solutions - What does it takes to increase the financial resilience of our communities and the people we serve? In June, Executive Director Janet Byrd and Financial Innovations Director Jill Winsor went on a journey to find out. Our Trip on the ‘Discrimination Bus Tour’ of Portland - A few weeks ago, NP staff had the opportunity to join other non-profit organizations on the Fair Housing Council of Oregon’s bus tour of historic housing discrimination. We knew it would be educational, full of insights, and also difficult as we journeyed back in history to better understand the legal and illegal tools and strategies Portland and Oregon have used over time to isolate and oppress people of color. Did You Miss the Oregon Retirement Savings Summit? - We know that people with lower incomes want to save. Given the proper opportunity and safe products they will take those first steps towards building more stable financial households for themselves and their families. Jessica Junke sat on a panel hosted by the Aspen Institute’s Financial Security Program to discuss. Participants were excited to learn about specific asset building resources in their community and want to learn more. Participants have a better understanding of asset building and want to share the information they learned with their teams and clients. Participants were excited to have the opportunity to connect with each other and strengthen relationships across agencies. Participants who joined us for day two loved the Your Money, Your Goals train-the-trainer session! Participants are excited to incorporate what they learned into their programming and share the information with their families and co-workers. Participants would love to have the opportunity to reconnect and learn how their colleagues are continuing to use the toolkit. Someone even suggested creating local “learning circles” to continue to explore and integrate the toolkit into their work! Participants wished the business community and policy-makers could have joined us. Participants wanted to learn more about how to ensure that asset building programming is culturally relevant to the communities they serve. Thanks to everyone who attended and responded to the survey. Thanks as well to our many co-sponsors including the City of Eugene, United Way of Lane County, NEDCO, ShelterCare, Oregon Department of Consumer & Business Services, JP Morgan Chase, and Bank On Oregon. Once, again please email Jill Winsor if you're interested in bringing an Asset Building Summit to your community.